The emerald waters and sugary white sands of Panama City Beach await you! This unit is eye level with the ocean. We also provide free beach service which includes 2 beach lounge chairs and beach umbrella set up daily on the beach for your use only!! This is a huge savings of $250 per week Free for our guest. Come on up to the 2nd floor where you will find a professionally decorated Condo providing you luxurious accommodations for your stay. Your master bedroom has a king size bed, walk-in closet, large bathroom and your own private access to the Gulf front balcony! The living room has a queen sleeper sofa for extra guest. Relax in your spacious living room or enjoy your nicely furnished gulf front balcony. 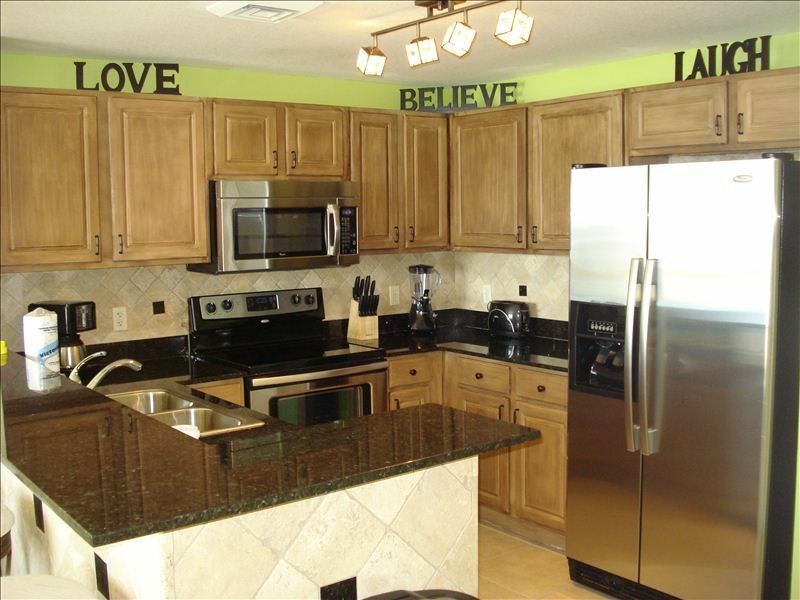 If you want to stay in, you will feel at home with your fully equipped kitchen, bar, granite countertops. There are many extras including nine foot ceilings throughout, separate laundry room with washer and dryer. There are two 175ft. free-forming heated pools and a Tiki Bar for refreshing beverages and snacks. We are steps for Pier Park an upscale outdoor shopping and dining development. THIS UNIT IS THE CLOSEST UNIT TO PIER PARK!! Only 2 miles from Frank Brown Park! WE ALSO HAVE A 3BR/2BTH IN CALYPSO JUST 3 DOORS DOWN UNIT 2-202 LOOK AT VRBO #193152,next door condo unit 2-204 vrbo#473128, and the Penthouse Suite 2BR/2BTH VRBO#280730! BALL TEAMS CAN STAY CLOSE TOGETHER! All our units are in the West Tower~closest to Pier Park! 2ND FLOOR HAS THE BEST VIEWS IN CALYPSO EYE LEVEL WITH THE OCEAN! 2ND FLOOR = LESS WAITING TIME FOR THE ELEVATOR, MORE TIME ON BEACH! IF LOCATION IS IMPORTANT TO YOU THAN 2-205 IS FOR YOU!! Keywords: OCEANFRONT,PIER PARK,FRANK BROWN PARK AND NEAR NEW AIRPORT, FREE BEACH SERVICE TOO! We are owners of Calypso 2-205 1BR/1.5BTH, 2-202 3BR/2BTH, 2-204 3BR/2BTH, 2-602 3BR/2BTH and 2-701 2BR/2BTH. We have many units to choose from and all our units come with free beach service as well. Calypso Resort and Towers is the best location is Panama City Beach. Its is the closest condo to Pier Park. Calypso is one of the newest resorts in the area with incredible amenities such as two 175ft free-forming pools, Tiki Bar, exercise room and much more! The resort is oceanfront and the views are spectacular! This unit is the closest walk to Pier Park period!!! If location is important to you than Calypso 2-205 is for you! Our unit is professionally decorated and the master bedroom is oceanfront with private access to the oversized balcony. The unit is on the 2nd floor = less elevator waiting times and is eye level with the ocean. We also provide free beach service a $250/week savings, telephone and internet service!! LARGE HALF BATH WITH LOTS OF ROOM. toilet, shower, jetted tub, HUGE MASTER BATHROOM WITH VERY LARGE WALK IN CLOSET. SOAK IN THE HUGE JETTED TUB IN THE MASTER BATHROOM. THERE IS A SEPARATE WALK IN SHOWER AS WELL. You are on the beach!! This unit has the best views in Calypso! You are EYE LEVEL WITH THE OCEAN!! Watch the sunsets from your large private balcony. You are in the beach!!!! The best quality sheets and soft plush towels provided. All our linen is sent out to be professionally cleaned. Covered Parking garage across the street. Pull up right in front of the complex use the unload/load parking spaces. For the condo. Pack your beach towels and pool towels. Work out room at Calypso. Multiple elevators, on the ocean, free beach service, walk to Pier Park! Large refrigerator and freezer with ice maker and filtered water! All the amenities of home are awaiting you. Granite countertops in the kitchen and separate wet bar. THERE ARE 3 BAR STOOLS AT THE BAR IN THE KITCHEN AND A DINING TABLE THAT SEATS 2. HUGE FLAT SCREEN TV ON THE WALL IN THE LIVING ROOM. TV IN THE BEDROOM TOO!! Large Plasma TV in Living Room and Large TV in Master Bedroom. Large balcony with private access from the master bedroom! Relax on this large balcony and enjoy your ocean front view. FREE BEACH SERVICE provides beach chairs and a beach umbrella set up daily on the beach for our renters this is a savings of $250 week! Two 175 ft free-forming pools. One of the pools is heated to 85 degrees. Plenty of lounge chairs around the pool. Tiki Bar between the pools for cold beverages and snacks. Free Beach Service which includes 2 beach lounge chairs with cushions and beach umbrella set up daily on the beach for your use this is a $250 savings per week!! FREE!!! We loved it. The condo was perfect In everyday!!! I always do a lot of research before I book. I guess you could say I’m pretty picky on where I spend my vacation. The resort itself was outstanding. The condo was perfect for my husband and I. The bed was very comfortable. The view was perfect. What you see In the pictures is what you get. We would definitely stay here again. I loved the second floor and the walk to the pool and beach was the shortest we’ve ever had. Thank you for the stay in your home. Upscale all the way!! Thank you so much for choosing our condo for your stay! We are pleased you found the condo perfect for your vacation and hope you return soon!! We had a wonderful time at this condo. The weather and the beach were perfect. Enjoyed the 2nd floor and the views were great! Perfect location to Pier Park. Thank you for sharing such a great condo we enjoyed our stay and we will return to condo again in the future. Jacqueline and Ken are great owners! Very much enjoyed staying at Calypso and in this condo. The family who owns the condo were so pleasant to deal with. I have rented many times at Calypso and other places. Most people are not that friendly and personable. It makes a huge difference for me. Anyway, the condo was just the right size for us. Very clean and organized. I will be returning to this condo or one of the others they own. Dealing with nice people make the experience so much better. Thank you all! Thank you so much for the lovely review. We appreciate having such great renters and welcome you back anytime to one of our several condos at Calypso! Had a great time, really enjoyed the condo. Very clean, loved the large pantry and bedroom closet. My husband was wary but he has since our return stated how impressed he was. The only thing missing in his opinion was larger TVs but we still enjoyed the little time we were indoors to watch TV. Our only observation (I hesitate to use the term complaint) is we found the spacious king size bed too hard for our tastes. We would definitely stay in one of your properties in the future so thank you so much! I am so glad you were very impressed with the condo and had a great stay! My husband & I stayed at this amazing Condo on the 2nd Floor for the month of February. Everything in the condo is in great condition. You can tell that the owners take pride in looking after this place. The kitchen is well stocked with everything that you need. Lots of pots, pans, dishes, cutlery glasses etc. The towels and linens were of very high quality. We found the owners to be extremely polite and pleasant to deal with. We received our deposit back very very promptly. (within 2 weeks) and we live in Canada that is good service. As other eviews have mentioned this location is perfect. It is walking distance to so many things. We also loved sitting on the balcony. It is very well protected from the wind, and the views are amazing. Thank you Ken & Jacqueline. We have already told quite a few of our friends about your different condos. We would not hesitate to use any of your condos again. We appreciate the lovely comments on our condo. We do take great pride in all our properties and want our renters to have an enjoyable vacation. We are pleased you enjoyed your stay! Thank you for recommending this condo to your friends and family. We do value such great great renters and hope you return again in the future. Thanks for choosing our condo for your stay! We are here now and are day 6 into our 9 day stay. I can tell you without hesitation this is a wonderful condo that is exactly as pictured on VRBO. It is nicely furnished, extremely clean and the kitchen is well stocked with every thing you need. The room is located just as you step off the elevator which is so convenient!!! And being only a block from Pier Park means you never have to move your car unless you want to. The owners are so easy to work with and will always be responsive to any question you may have. Thank you Jacqueline and Mr. Dewis for another great stay!! Can't wait to rent from you again!! Thank you so much for choosing our condo year after year. We appreciate your repeat business and its so nice to have such renters. We are pleased you enjoyed the condo and had everything you needed. We hope you return again soon. We are the CLOSEST UNIT TO PIER PARK!! Walk to the new and upscale Pier Park with lots of dining and shopping. Less than 1 mile from the baseball fields. LOCATION LOCATION LOCATION!! THE ABOVE PRICES INCLUDE THE TAXES! RATES SUBJECT TO CHANGE. THE $300 REFUNDABLE DEPOSIT IS DUE WITHIN 5 DAYS OF BOOKING. THE TOTAL RENT IS DUE 60 DAYS PRIOR TO ARRIVAL DATE. ONCE WE RECEIVE THE TOTAL RENT THE DOOR CODE AND ARRIVAL INFO IS EMAILED.